​*Free bonus stop at Bird Rock in Del Mar 3:15pm - 3:45pm. An extra 19 miles. Route 3 // 9:00am - 12:30pm // 6 stops, but 5 locations. 1.75 mile route. Suggested for biking, jogging, or walking. Route 4 // 9:30am - 12:40pm // 5 stops, but 4 locations. 12.5 mile route. Self-driving route. 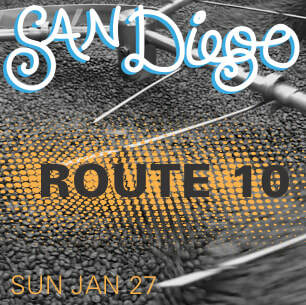 Route 6 // 11:00am - 2:30pm // 6 stops, but 5 locations. 8.75 miles. Self-driving route. - ***This close to the event when you purchase a ticket we'll send a confirmation, but your physical ticket will be at your route start for you. - It doesn't happen often, but there have been shops on Caffeine Crawls that have closed down in between route planning and the actual Caffeine Crawl. We do the best we can to rearrange that. Route 1 is sold out. Routes 2, 3 and 5 are sold out. ​Route 7 and 9 are sold out. 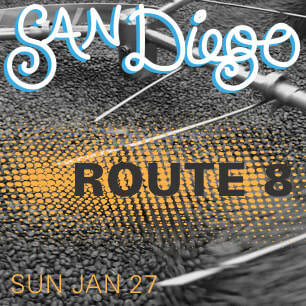 Route 7 starts at The route starts at Cafe Virtuoso Coffee Roasters (1616 National Ave, San Diego, CA 92113) at 9:00am. .